Win £75 to spend at marc b. & £175 to spend at ASOS! 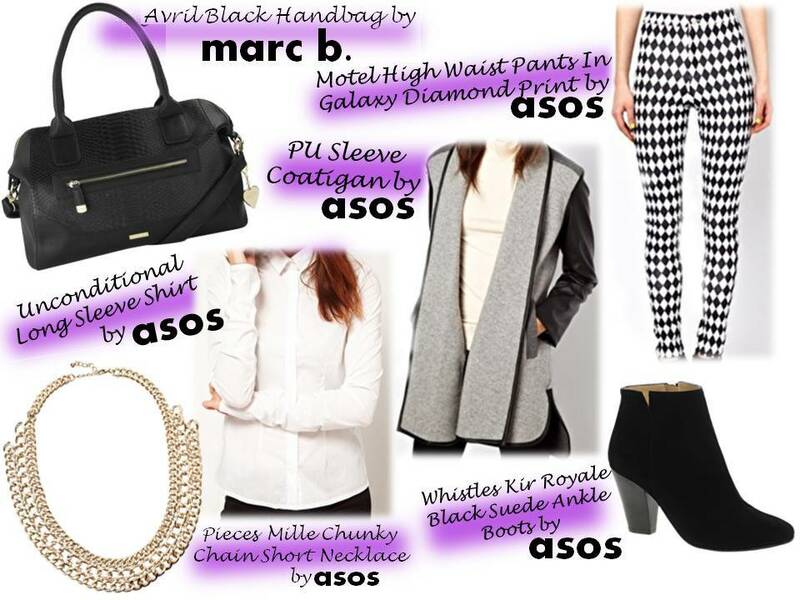 etail PR have teamed up with Marc B and ASOS to give us lucky bloggers a chance to win £75 to spend at marc b and £175 to spend at ASOS! All you need to do is create a collage of a look including a marc b handbag and ASOS clothing - you can take a look at the marc b range here and the ASOS collection here. For my chosen look, I chose the Avril Black Handbag from marc b's collection and paired it with these monochrome diamond print pants and thought this simplistic shirt would look great tucked in. The necklace will add some show to the shirt and the boots will add a finishing touch. Finally, this 'cotigan' would be great to throw over to keep nice and snug! This look is also bang on trend for next seasons Monochrome trend. If you would like to enter this amazing competition then you can find out more details here!